The Rhode Island General Assembly voted on June 30, 2017, for passage of the bill to ban conversion therapy on LGBTQ youth. The bill is now on its way to the Governor, where it is expected to be signed into law. 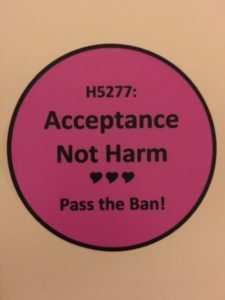 GLAD has been working with partners in Rhode Island this session to pass this bill which would make it impermissible for licensed health professionals working with minors to engage in the harmful and discredited practice of conversion therapy. Senior Attorney Patience Crozier delivered testimony before the House Health, Education & Welfare Committee on February 15, 2017. So-called “conversion therapy” is a remnant of our nation’s shameful history of oppression of lesbian, gay, bisexual and transgender people. The term conversion therapy refers to a range of dangerous practices that seek to change a person’s sexual orientation or gender identity. More information about the efforts to pass the bill to ban conversion therapy in Rhode Island. Read the text of the Rhode Island Conversion Therapy Ban Bill.